The performance series MD301 (Music Dance 301) was created in direct response to a need for public and artists to re-consider and re-present dance/music performance within a contemporary context.MD301 series presents improvised performance with an explicit choreographic/composition approach as well as set works that have as main focus the relationship movement-sound.The series invites local and international artists to perform. These artists share the aim to question how to compose and execute a visual and sonic piece under the scrutiny of a public as witness. 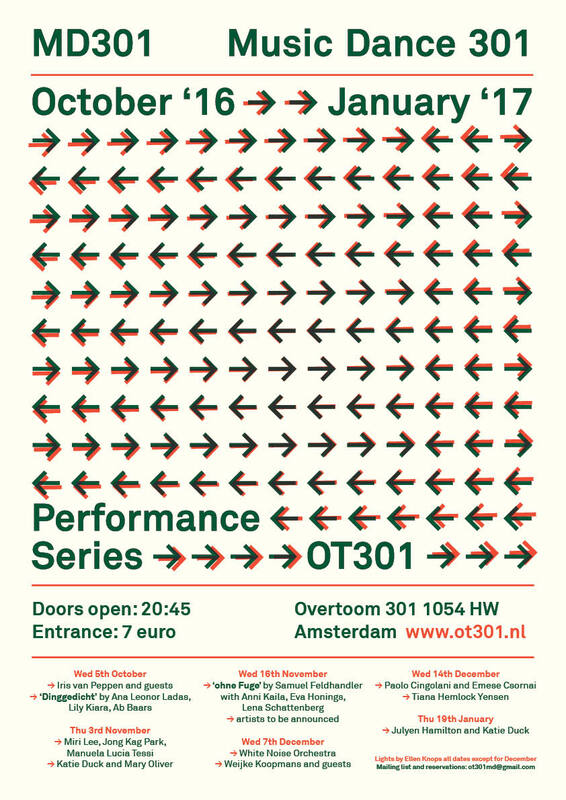 The events are held in Amsterdam in cultural centre OT301. This location is central to the Amsterdam art underground scene and has had a long history of hosting experimental music and dance events. Manuela Tessi curates the series collaborating with light designer Ellen Knops. Artists can submit their proposals all year long to ot301md@gmail.com. The programming is done as of 4-6 months in advance but interesting propositions will be taken into consideration for future events. MD301 does not have fundings, the costs of the space and technical help are covered from the door revenue, and the remaining funds equally distributed to the perfomers.The series receives support and is connected to Sunday Sessions, a platform for dancers, actors, vocalist, musicians and text artist who wish to gather and share their practice.Sunday Sessions are held weekly in studio BodlabOT OT301 18:30-20:30 and are chaired by Katie Duck, Manuela Tessi, Miri Lee and other active members of the Amsterdam independent community of performers. 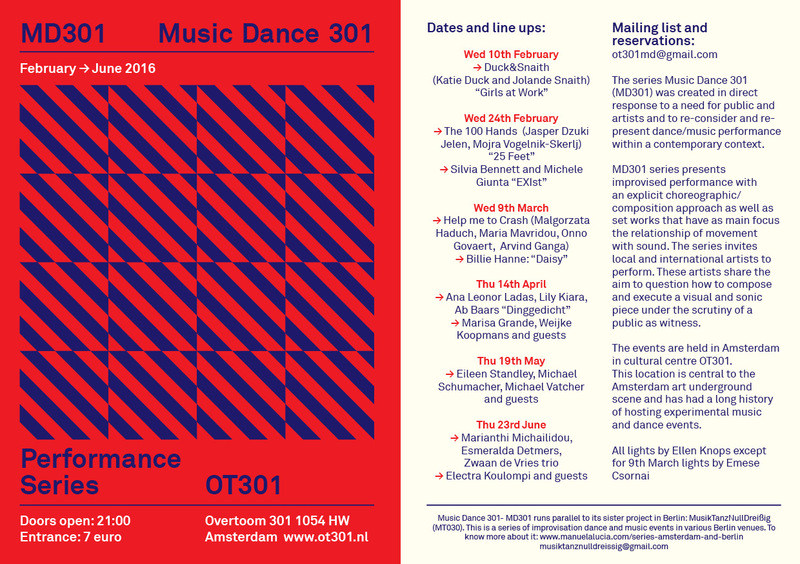 The original Music/Dance 301 was founded in 2005 by dancer Alexandra Manasse and musician Colin McLean.It was a music and dance improvisation event happening monthly at OT301, Amsterdam. Performers came from a core group who also organized the event and invited guest artists to play with them. The main focus was on free form collective improvisation where both music and dance elements have equally important and complementary roles. In 2009 dancers Makiko Ito,Malgorzata Haduch and Manuela Tessi continued to curate dance performance events with live music in collaboration with ColinMcLean a.o. These events included both instantly composed performances or choreographies. The Music/Dance title remained as a container for performances in which the relationship between live music/sound and dance/movement was at the core. 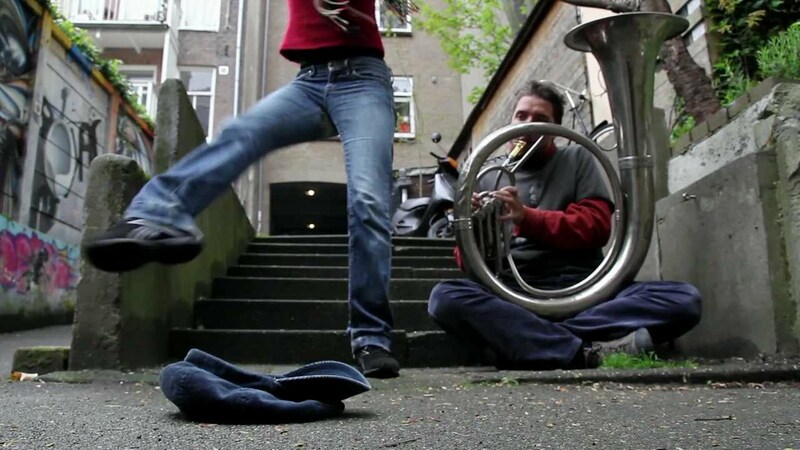 Manuela Tessi continued to curate these events from 2012 on, and after a season spent working in Berlin she restructured the Amsterdam series, giving a similar direction to the projects in both cities.She finds it essential, in the times we are living in, to contribute to the production of art by creating platforms and gathering crowds to experience the work. These platforms provide an opportunity for her own as well as peers work, offering continuity in the research. She believes that creativity needs to be promoted bottom-up, getting your hands dirty, digging into the material without waiting for permission from public funding or any established venues.